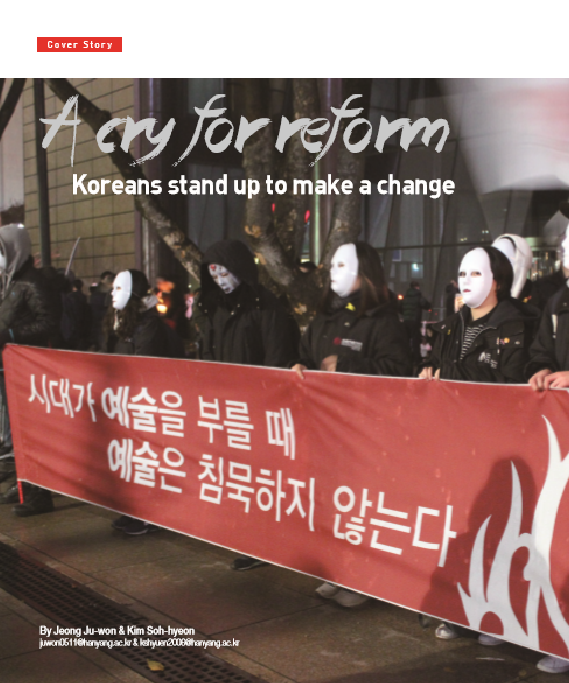 Korean society has just recently come face to face with a political scandal that has disgusted many. It was recently revealed that the Korean president has been under the influence of a close individual that is not a part of her political assistance party. In face of these recent events, government officials, the media, and civilians alike have all resorted in their own way, to shed light on this scandal. This is only to be encouraged seeing that in a democratic society, it is crucial for everyone to participate and voice their opinions about the current political status of their nation. The political scandal started to rear its ugly head when Ewha Womans University students started to demand the resignation of the president of Ewha Womans University. One of their many reasons for such demands was because the president of Ewha University has been increasingly showing favoritism towards the daughter of President Park Geun-hye’s confidante, Choi Soon-sil. It had later been revealed that the daughter in question had received passing marks on a report that was filled with grammatical errors and logical fallacies because the professors were made aware by the president of Ewha University, to show her favoritism. Politicians, like Rep. Kim Byoung-wook from the Minjoo Party of Korea has repeatedly accused Jung of being excused to attend classes and receiving good grades regardless of her academic performances. The plot thickens as questions about Jung Yu-ra’s acceptance to Ewha in the first place started to rise through one’s conscience. As it turns out, Jung was originally ineligible for admission because requirements for applicants in 2014 were to have won at least an individual bronze medal in a major sporting event. The gold medal that Jung won at the Asian Games in September 14, 2014, was awarded to her for participating in a team event and was even awarded after the school’s deadline for application. Administrative officials of Ewha Womans University have, of course, initially denied all claims. Jung’s favoritism scandal is closely related to Choi’s political scandal because it was the first event that had brought light to a much bigger problem that was hiding in the dark shadows of political injustice. By inspecting how Jung was able to receive such favoritism, the existence of President Park’s confidante Choi, was presented to the public. The word ‘Gate’ originated from the Watergate incident that had occurred in America in 1972. To ensure his reelection, President Nixon had ordered a break in at the Democratic National Committee headquarters at the Watergate office complex in Washington D.C. in 1972. Due to this incident, President Nixon became the first American president in history who resigned without fulfilling his full term in the Oval Office. Ever since the suffix ‘-gate’ has been synonymous with political scandals around the world. The crucial problem with the Choi Soon-sil Gate lies under the fact that such an incident prominently shows the incompetency of the current government. The people of South Korea have always trusted their leader to be someone who is capable of individual comprehensive thoughts and actions. Such trust has been thrust and broken into half when Choi’s old Tablet PC was recovered. In it was evidence that Choi had revised President Park’s political speech, the one she gave in Dresden, Germany. In light of such an event, media outlets, government officials and civilians alike have come together to fight against such political injustice. Media outlets like KBC, SBS, and MBC have all created individual news rooms that focus on reporting the truth behind the recent Soon-sil Gate, while news outlets like JTBC have gone a step further by constantly disclosing more evidence, or truth, to the public. Citizens have started to organize their own protests in hopes that their voices would reach the Blue House. Even now, a peaceful protest is held in the Gwanghwahmun Gate every day. University students have been voluntarily participating in the declaration of the state of affairs. When the current situation is considered as a political or social chaos, professors or the intellectuals or the religion figures gather at the same place at the same time to announce their concerns for the situation and demand the resolutions to the problem. The typical declaration of the state of affairs in Korea in the past was done right after 4.19 Revolution in April 25, 1960. The professors had done the declaration against Lee Syngman government because of the rigged election and the continued dictatorship. Lee Syng-man decided to resign after the declaration. The action of declaration started in Ewha Womans University in October 26. The Ewha students announced the declaration entitled “Is Republic of Korea the country where Choi Soon-sil’s dream comes true?” This is motivated from the slogan that President Park used “The country where the dreams come true” during the election. As Ewha Womans University is directly related to the issue of illicit admission of Jung Yu-ra, the declaration strongly criticized the reality of letting her confidante Choi Soon-sil, who does not hold an official government post, view confidential documents and presidential speeches. Also the students issued a problem of the prosecution’s inappropriate attitudes towards the inspection. They claimed that the president should take all the responsibility for the political scandal and if it is insufficient, the president should resign. Starting from Ewha Womans University, the declaration spread to Sogang University, Kyung Hee University, Sungkyunkwan University, Konkuk University, Dongduk Women’s University, and Hanyang University. The univerisities all around the nation are still announcing their official opinions in regard to this issue. Universities had different ways to present their declarations and its content has somewhat differences. Sogang university, where President Park graduated, used the slogan “Be as proud of Sogang as Sogang is proud of you” to “Colleague, please stop tarnishing the Sogang’s proud.” The students pointed out that the president has lost the competence as a president by providing all the confidential documents to someone who is not even a government offical. Hankuk University of Foreign Studies announced the declaration in 9 different languages that although it is a shame as a Korean it should be known by all the people around the world. It was done in Korean, English, Chinese, Japanese, French, Spanish, Portuguese, Italian and Swedish. The way to present the declaration showed its identity as the institute where 45 different languages are taught. However, not every university has agreed with doing the declaration from the beginning. On the facebook page of Inje University, the General students’ association gave an answer to the constant questions about the declaration plan from the university students. The association said “As the association represents the Inje University, the decision to do the declaration or not may be seen as an instigation. Therefore, the association will stay neutral on this issue.” The position taken by the association was condemned by many students and even from the professors. Then the association apologized for their carelessness to use the words ‘instigation’, and ‘neutral’ and acknowledged their lack of consideration of responsibility as the representative of the university. The students of Inje University have also participated in the declaration. Hanyang University has also done several declarations. The first declaration was done in October 27. The students declared “We denounce ‘Choi Soonsil gate’ that is shaking the foundation of the democracy.” It was mainly about demanding quick and transparent inspection of the prosecution towards Choi Soon-sil gate and Jung Yu-ra’s illicit admission and all the preferential treatments she had received. According to the General students’ association of Hanyang University, since the first declaration was done in October and as more and more information are revealed, the resignation of President Park wasn’t included yet. The association has done the second declaration in November 3rd with the students, professors, alumnus, and the faculty. The second one included the resignation of the president. During the assembly, the students did parodies of Jung Yu-ra, Choi Soon-sil, and President Park. Also, the students have done a street demonstration which took place from the place where the declaration was held, in front of the lion statue to the Wangsimni station. The president of the association emphasized the importance of taking actions when our rights are invaded. “Taking actions for the injustice is the role of the nation including the university students.” To the question of what are the things that the students should be careful for taking such actions, he answered “We should carefully judge whether our rights have been invaded or not and then take actions.” It is important to know exactly what is invaded and then we should take actions to recover the invaded rights. The anger among Koreans is getting bigger despite three times of apologies from President Park. The attitudes of the President made the people angrier. There are basically two different solutions that Koreans are claiming for, impeachment or resignation. Impeachment is a system of punishing or dismissing executives by the constitutional law. The national assembly publicly arraigns and the constitutional court judges whether to sentence the punishment or the expulsion. The constitutional law regulates “When the national public officials such as the president, prime minister and cabinet member violate the law or the constitutional law, the national assembly can vote the legal action of the impeachment.” Impeachment of the president needs the motion of more than half of the enrolled members of the national assembly and two thirds of the enrolled members’ approval for the motion. If it passes, then the power of the president is halted until the constitutional court’s decision for the impeachment. The decision needs approval of more than six out of nine judges. In the past, an action to impeach the president Roh Moo-hyun was first taken in March, 2004. However, after the decision, the candlelight rallies against the impeachment spread within the country and the constitutional court dismissed the decision to impeach the president. Unlike the impeachment, resignation means to step down from one’s position by oneself. In Korea, there are three presidents who resigned their positions throughout history. Lee Syng-man resigned due to the 4.19 revolution and Yun Bo-seon who became a president after the May 16 coup resigned after one year presidency and lastly, Choi Kyu-ha resigned after repressing 5.18 pro-democracy movement with martial law army. The possibility of succeeding impeachment is relatively low in that although the opposition party now became a majority by the last general election, it is difficult to have more than two thirds of the enrolled members to agree with the impeachment. This is basically why Koreans are claiming for the president’s resignation. Due to the president’s political vacuum, there are two different ways to fill the gap. On the occurrence of the vacancy in the case of resignation or the death of the president, the country should go through the by-election within 60 days of the vacancy of the position. When an accident occurs to the president and the president cannot do the job, the acting president rules the country. An all-nation Cabinet has been proposed as a solution to this situation instead of the resignation of the president by the current ruling party. The prime minister gets power to rule the country and this raises another problem of who gets the responsibility to nominate the next prime minister. Everyday new information is coming out and that makes it hard to catch up with the current issue. As more time is invested in the case, there is a possibility that the attention towards this case might decrease. However, a lot of people are constantly participating in this issue and the number of participants attending the candlelight rallies or declaring their opinions is increasing with every passing moment. Korea has long struggled with a low voting rate and low political participation for a long time, but now people are actively working on to make their own voices and change the world a better place. Although it could be a tough and depressing time because people had to learn unexpected and shocking facts every day, this became an another opportunity for Koreans to become ‘one’.